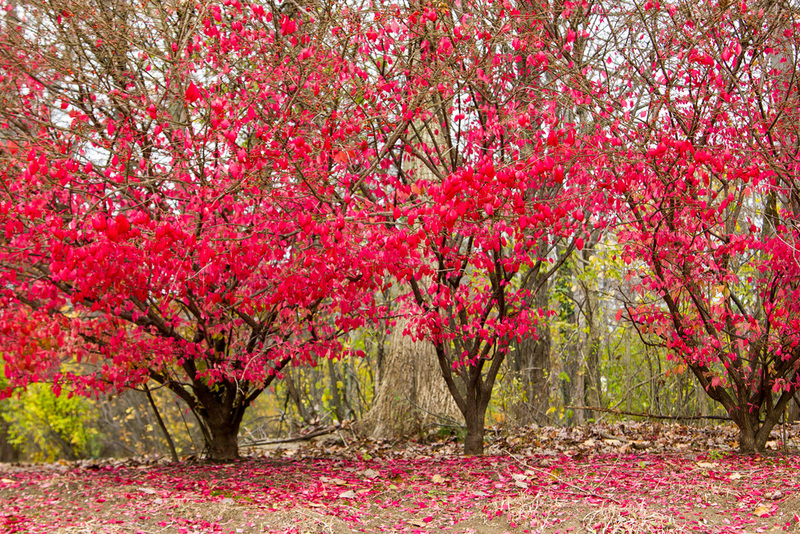 Fall is a spectacular season in Ohio. Bright red, gold, and bronze color the landscape, creating the most magnificent scene. 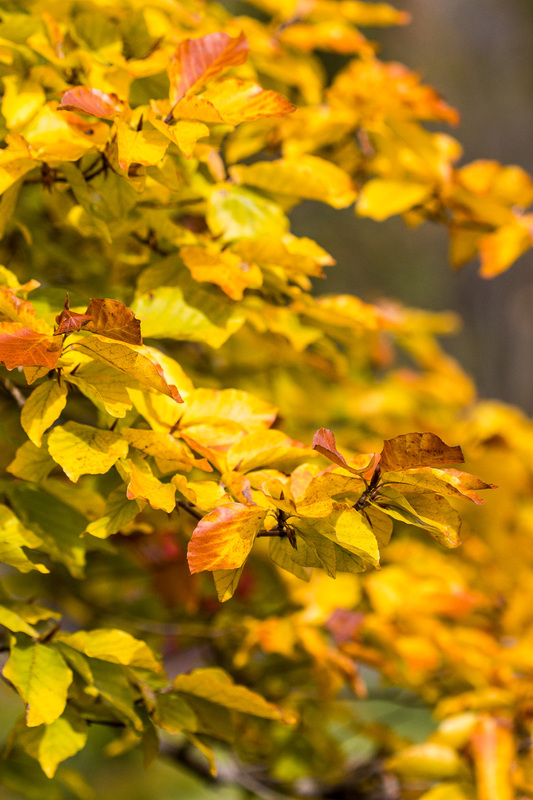 I always feel fortunate to be able to experience this time of the year. 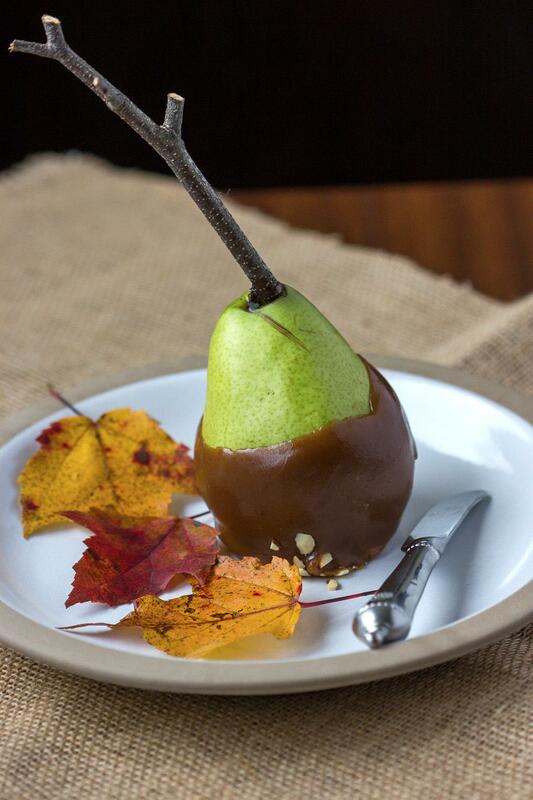 Caramel apples are a seasonal favorite, but this year my attention turned to pears. I like that they are softer to bite into than apples, and are equally delicious coated in caramel. Then again, what isn't? I considered several recipes before deciding on this one from Epicurious. It's a slight departure from the traditional method of making caramel, and substitutes sweetened condensed milk for the heavy cream in it's base. But what really sold me were the reviews. 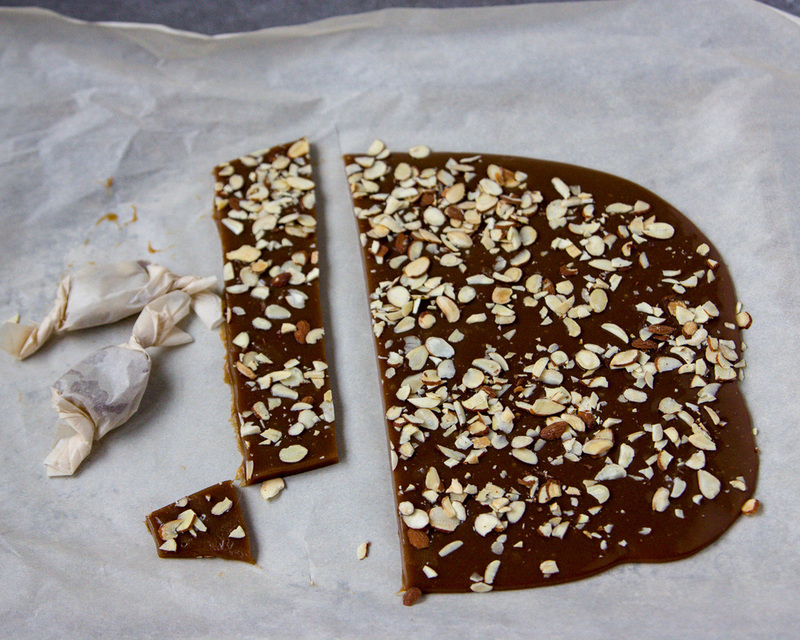 People raved that it was the best tasting caramel ever, and I have to agree. It's pretty darn good! The addition of maple syrup and a touch of dark molasses create a deep rich color and add depth of flavor. It coated the pears beautifully and set up nicely. The recipe is easy and straightforward, but note that you will need a candy thermometer to make it. You should have enough caramel to cover 12 apples or pears. If you use less fruit and have leftover caramel, it can be spread onto a parchment lined cookie sheet , sprinkled with nuts, dried fruit, or left plain, and placed in the refrigerator to set for several hours. 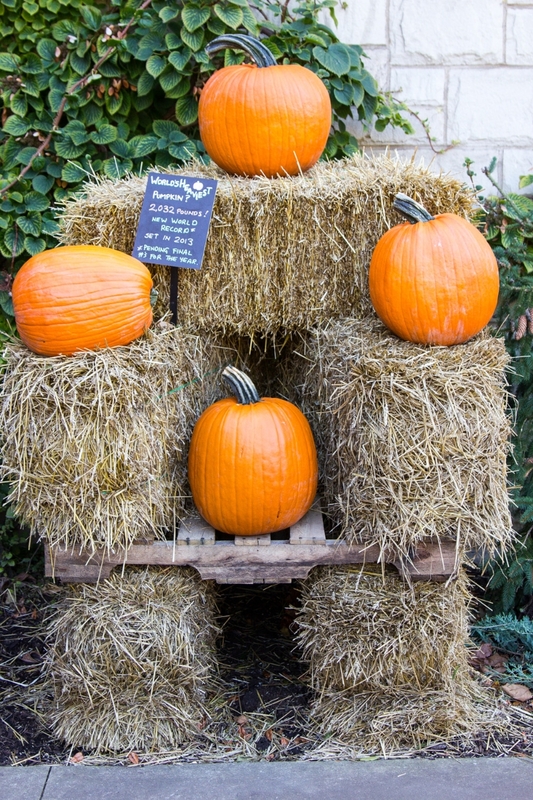 To serve, cut it into squares and wrap in wax paper or parchment for a delicious treat. 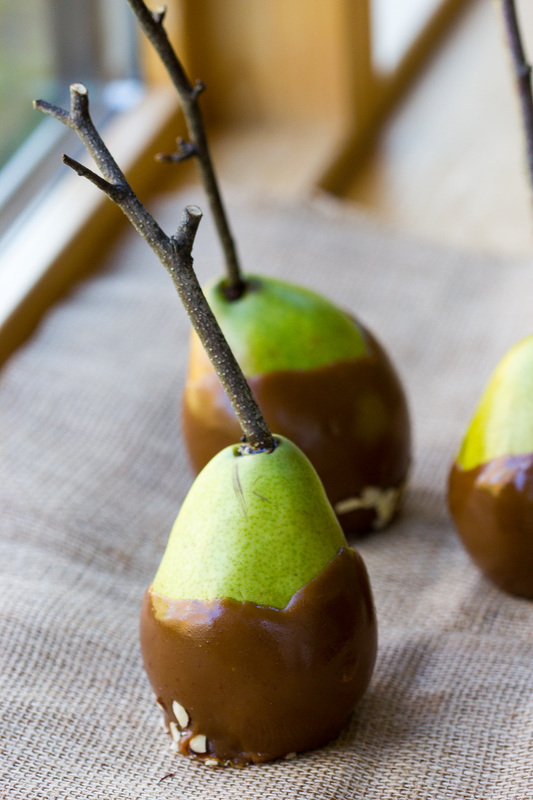 Select pears that are neither too ripe nor too hard. Wash, remove the stem, and replace it with the stick or twig, making certain that it is secure. 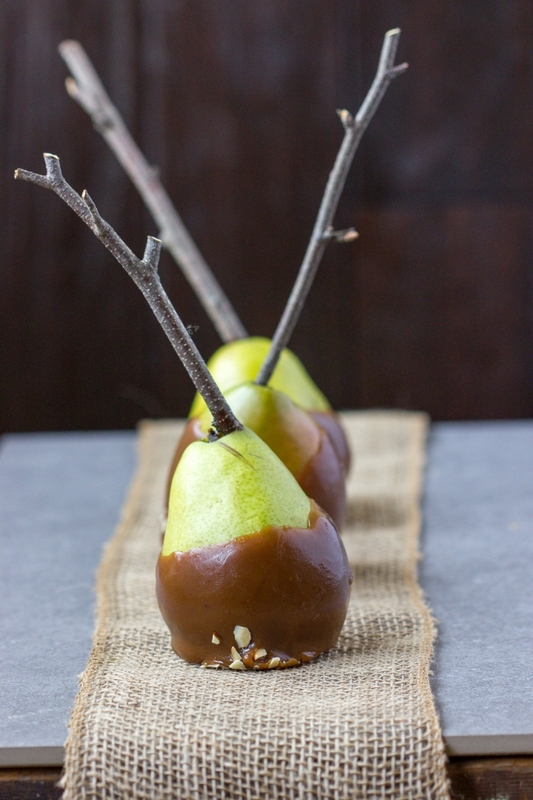 Chill the pears in the refrigerator while you prepare the caramel. Combine the first 8 ingredients in a saucepan. Stir with a spatula or wooden spoon over medium low heat until the sugar dissolves, about 15 minutes. Check by rubbing the mixture between your fingers. You should not feel the sugar crystals. Attach the clip on candy thermometer to the side of the pan. Increase the heat slightly and boil the caramel until the thermometer registers 236F (soft boil stage). It's important to stir the mixture constantly to prevent scorching. Once you've reached 236F, remove from heat and pour it into a tall narrow bowl or pan, without scraping. Set aside and allow to cool to 200F before attempting to dip the pears. Have a baking sheet lined with parchment or a silpat waiting. 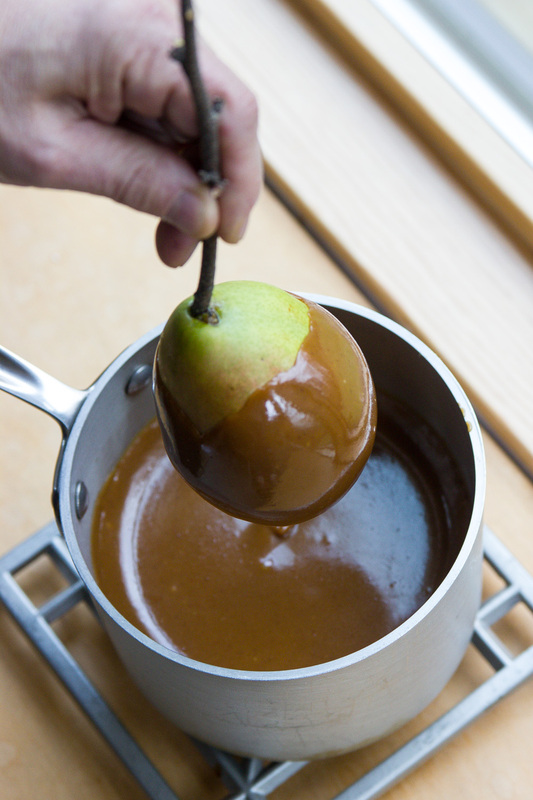 Once the caramel has cooled to 200F, you can begin dipping the pears. Holding it by its stick or twig, submerge it into the caramel about 3/4 of the way. Lift up, and carefully turn upside down, twirling and allowing the excess to drip off. You can also use a spoon at this point to scrape a bit off the bottom so that it won't pool on the baking sheet. Place on prepared baking sheet. Allow to set up partially (chill for 15 minutes) before adding optional decorations. Firmly press decorations into caramel. Chill until set ( 1 hour) before serving or cover and store in the refrigerator up to 1 week.